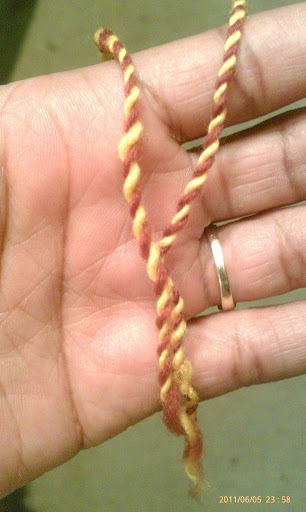 I promise to post real soon about my brand new spinning wheel (Majacraft Suzie Pro) but for now I'll just show you the small sample of maroon and gold merino that I spun up last night, er, early this morning. Maroon and gold are Oberlin's school colors. This superwash merino is from Tuscan Grove and is called Winning Colors. The colors are separate and I wanted rises how they'd look spun separately and then plied together. Whaddya think? Unfortunately I didn't spin up enough to knit a sample but I think it'll look cool as socks, perhaps. What would you knit with it? I'm writing this big as I eat breakfast, and now it's time to nice into high gear and get ready for work. Have a great Monday!